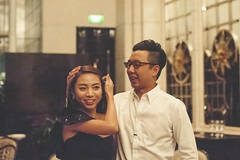 31st Dec 2011 marks a special day for Jen and Khim. Jen had chosen this day to propose to his girlfriend of 7 years, making 2012 a brand new start for the both of them. The whole proposal was built to be a literal walk down memory lane with photo frames hanging on the walls and their love articles decorated all over the room.